The case we are presenting is interesting because up to our knowledge and based on the extensive searched done, it presents the fourth case of multiple FeP without any known risk factors. 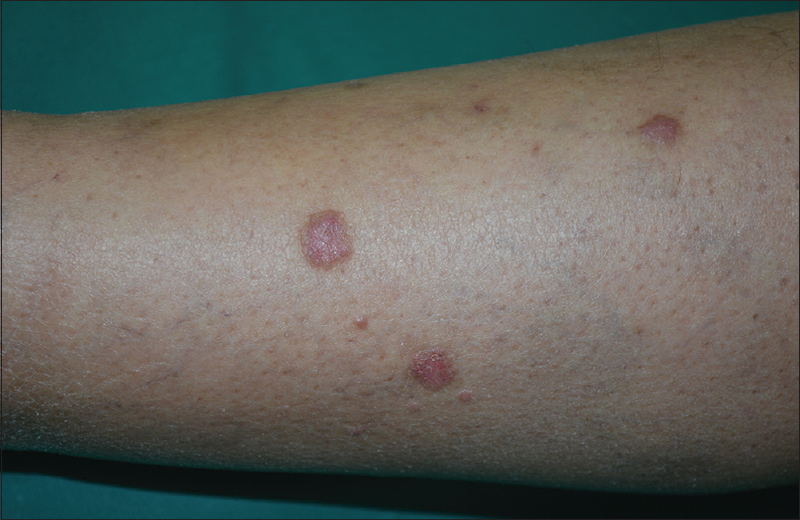 We are reporting a 62-year-old male presented with asymptomatic multiple skin lesions, occurring bilaterally on lower extremities and gradually increasing in size over a period of 4 years. The clinical examination revealed a sharply demarcated erythematous scaly papules and plaques of a variable sizes ranging from 5 mm to 10 mm in diameter. There was an ulcerated red-brown well-defined papule (5 mm × 5 mm) on the face [Figure 1]. The differential diagnosis was psoriasis, pityriasis lichenoides chronica, or lichen planus. 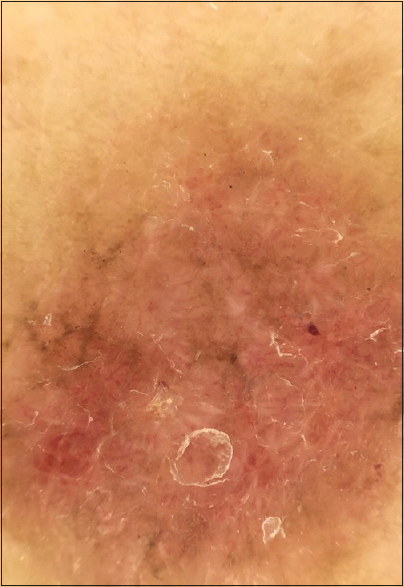 The dermoscopic examination showed fine arborizing vessels, white streaks, and an irregularly distributed brown structureless area of pigmentation [Figure 2]. The histologic examination of a 4 mm punch biopsy showed a thin anastomosing strands of basaloid cells projecting from the epidermis in a fenestrated pattern. The cords of a peripheral palisading basaloid cells are embedded in abundant fibrous stroma. Based on the microscopic features, the diagnosis of FeP was made [Figure 3]. However, due to the rarity of FeP occurring as a multiple lesions, conformational biopsies were taken from the leg and the face. The result was consistent with the initial histologic diagnosis, however, the facial lesion turned out to be basal cell carcinoma (BCC). Detailed medical and family histories were unremarkable. There was no history of exposure to radiation or ingestion of potential carcinogenic material. Full skin and systemic examination were normal. Imagining studies, namely X-rays of the skull, chest, and jaw, as well as an ultrasound of abdomen and pelvis, were normal. All lesions were excised surgically followed by primary closure. Follow-up visits were arranged monthly for the first 3 months then every 6 months, during which the patient was clinical free. FeP is considered a relatively rare tumor. According to BCCs series, the frequency of FeP ranges from 0.2% to 1.4%. However, the true incidence of FeP may be underreported, as FeP is frequently mistaken for a variety of benign lesions which may not be treated or biopsied., Most FePs appear in 4th–6th decade;, few cases were reported in pediatric population. FeP has slightly higher prevalence among females. FeP usually presents as a asymptomatic, solitary, firm, skin-colored or slightly brown-gray, fleshy, sessile, or pedunculated papule with a broad base. Infrequently, it may present as ulcerated nodule., Presentation as multiple lesions is rare., FeP occurs mainly on the trunk with predilection for the lumbosacral area, but it may arise in atypical locations such as extremities, axillae, groin, head, genitalia, and planter foot., In contrast to BCC, FeP shows no predilection for sun-exposed sites. Yet, it tends to develop more often in patients with a history of BCC. FeP may mimic various benign conditions, for example, acrochordon, pedunculate fibroma, neurofibroma, or seborrheic keratosis (SK). It may also be mistaken for amelanotic melanoma. FeP is characterized histologically by numerous, elongated, 2–3 cell thick anastomosing strands of basaloid cells projecting downward from the epidermis into the dermis within a fibrotic stroma, giving the tumor a honeycomb appearance., Histological differential diagnosis includes reticulated SK, tumor of follicular infundibulum, eccrine syringofibroadenoma, and mammary intracanalicular fibroadenoma. It occurs not only in a pure form but also in combination with another form of BCC. Dermoscopy of FeP reveals polymorphous vascular pattern consisting of fine short arborizing vessels either alone or in association with dotted vessels, and shiny white streaks, known as crystalline structures, that are only visible on polarized dermoscopy. Gray-brown irregularly distributed structureless pigmentation associated with a variable number of gray-blue dot characterizes the pigmented FePs. Additional features may include milia-like cysts and ulceration. A recently reported feature that may be more specific for FeP is the white network. It correlates with a regular anastomosing network of epithelial cells strands of emanating from the undersurface of epidermis. FeP has an indolent course. Aggressive behavior, local destruction, or metastasis is extremely rare.,, Complete surgical excision of tumor is curative., Other treatment modalities include electrodessication and curettage, cryosurgery, or Mohs surgery., Topical imiquimod 5% is ineffective in treating FeP. FeP has been documented to occur in association with previous exposure to radiation in various publications.,, The degree to which radiation contributes to the development and evolution of FeP is not clear. Predisposing genetic factors should be suspected in patients with multiple, widespread, and early-onset lesions. Some syndromes are associated with multiple BCCs, including FePs, namely Gorlin, Bazex, and Rombo syndromes. We reviewed the published literature in an attempt to assess the incidence of multiple FeP. The term “Pinkus tumor,” “fibroepithelila BCC,” and “FeP” have been searched in PubMed without restriction up to March 2018. Four hundred and ninety-nine published articles associated with FeP were found. A total of six articles only reported FeP presenting as multiple lesions.,,,,,, Majority of these cases were associated with exposure to radiation.,, Only three articles reported multiple FeP occurred in isolation of any inherited genetic abnormality and radiation exposure.,, Sehli Attafi et al. 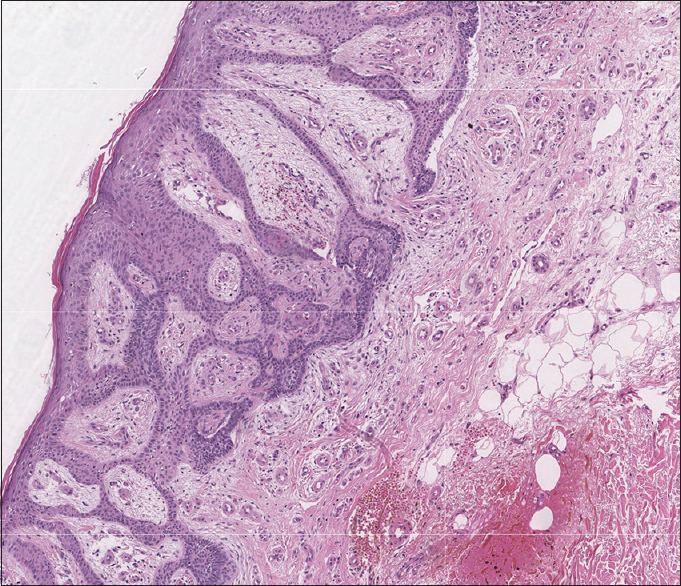 described a 55-year-old male with multiple lesions that clinically resembled SK, but histological confirmed to be FeP. Barr et al. reported an 80-year-old male with four FeP. He mentioned that multiple FeP accounted for 36% of the total reported cases at that time. However, there was no specification to whether this percentage included cases with antecedent radiation or genetic abnormalities. Rodriguez and Festa Neto reported multiple FeP occurring in a nevoid distribution associated with SK. The case we are presenting is interesting because up to our knowledge and based on the extensive searched done, it presents the fourth case of multiple FeP without a history of antecedent radiation and occurring independently of genetic diseases predisposing to skin malignancy. In addition, it has atypical clinical presentation and uncommon distribution. Haddock ES, Cohen PR. Fibroepithelioma of pinkus revisited. Dermatol Ther (Heidelb) 2016;6:347-62. Zalaudek I, Ferrara G, Broganelli P, Moscarella E, Mordente I, Giacomel J, et al. Dermoscopy patterns of fibroepithelioma of pinkus. Arch Dermatol 2006;142:1318-22. Kornreich DA, Lee JB. White network in fibroepithelioma of pinkus. JAAD Case Rep 2016;2:400-2. Colomb D, Vittori F, Perraud R. Basal cell epithelioma and multiple fibroepithelial pinkus' tumors in the lumbosacral region. Discussion of the precipitating role of previous radiotherapy treatment. Apropos of 4 cases. Sem Hop 1975;51:2655-64. Colomb D, Bréchard JL, Gho A, Caux Y. On five new cases of association of basal cell carcinoma and multiple pinkus fibroepithelial tumors on the spine following radiation damage to the skin (author's transl). Ann Dermatol Venereol 1979;106:875-82. DE Graciansky P, Hewitt J, Boulle S, Boulle M, Pineau M. Multiple basal cell epitheliomatosis of various types (including fibroepithelial tumors of pinkus) developing years after occupational exposure to roentgen rays. Bull Soc Fr Dermatol Syphiligr 1955;3:308-11. Castori M, Morrone A, Kanitakis J, Grammatico P. Genetic skin diseases predisposing to basal cell carcinoma. Eur J Dermatol 2012;22:299-309. Sehli Attafi S, Jones M, Fazaa B, Zermani R, Rommany SR. Pinkus tumour: An unusual case. Pathologica 2013;105:140-1. Barr RJ, Herten RJ, Stone OJ. Multiple premalignant fibroepitheliomas of pinkus: A case report and review of the literature. Cutis 1978;21:335-7. Rodriguez RA, Festa Neto C. Multiple fibroepithelial basal cell carcinoma of pinkus associated with seborrheic keratosis in a nevoid distribution. J Dermatol 2000;27:341-5.